The #1 ranked Alberta Golden Bears shut down the high powered University of New Brunswick Varsity Reds en route to a 6-3 victory in the University Cup final tonight in Halifax. It is Alberta's record 15th National Championship. The Golden Bears jumped out to a 2-0 lead after the 1st period and the V-Reds were never able to get over the hump. Dylan Willick scored at 3:05 of the 2nd period to cut the lead in half. Perhaps the turning point came late in the period when UNB couldn't do anything on back to back power plays and then Johnny Lazo scored with 3.6 seconds remaining to give Alberta a 3-1 lead heading into the 3rd. The V-Reds kept on battling back though. Philippe Maillet tipped a Jordan Murray shot at 7:55 to make it 3-2. Kruise Reddick made it 4-2 with Alberta's 2nd power play goal of the game at 11:12, but Adrian Robertson's fluttering shot made it 4-3 with 4:10 remaining. UNB was then awarded a late power play with a chance to tie the game, but a turnover led to a 2-on-0 break for Alberta and Levko Koper notched the shorthanded goal. Jordan Rowley capped the scoring with another shorthanded goal, this time into an empty net. - UNB got a bit of a taste of their own medicine as they were out-shot 24-9 in the game, including 14-3 in the 3rd period. It has been a long time since the Varsity Reds weren't able to get at least 10 shots on goal in a game. Usually it is UNB who locks things down in the 3rd period, but not on this night. - The story of the game, besides Alberta's defensive play and exceptional shot blocking, was the special teams. The Golden Bears went 2 for 5 on the power play and scored 2 shorthanded goals. UNB was 0 for 7 and didn't look particularly dangerous on any of them. They had a couple of power plays while trailing by a goal and couldn't take advantage. - Attendance was 4404 on a snowy night in Halifax. - Dylan Willick and Levko Koper were named the player's of the game. - UNB is now 5-5 all-time in national finals, including 0-3 against Alberta. - Jordan Murray and Cam Braes were named to the tournament all-star team. - Guelph defeated UQTR 3-2 in overtime earlier today to win the bronze medal. - While it is obviously a very disappointing end to the season for the Varsity Reds we should all be proud of the what they accomplished this season. They are an extremely young team who were playing a veteran Golden Bears team - many of whom played in last year's final. The fact that they finished 1st in the AUS in the regular season, won the AUS Championship, and made the National Championship game with so many players in their 1st or 2nd year is quite impressive and this learning experience should only serve them well moving forward. If there is one thing we can all be sure of, it's that Gardiner MacDougall and Co. will be doing all they can over the summer to make the V-Reds even stronger next season. It will be a fitting end to the CIS men's hockey season as the #1 seeded Alberta Golden Bears - ranked #1 in all 20 polls this year - will face the #2 seeded University of New Brunswick Varsity Reds, who were ranked 2nd in all but 6 polls, for the National Championship tomorrow at 6:30PM. This will be the 10th meeting all-time between the two hockey powers, with 7 of the previous 9 coming on the national stage. 1996/1997: Won 4-3 in OT in national semi-final. 1997/1998: Won 5-2 in national semi-final. 1999/2000: Lost 5-4 in OT in national final. 2002/2003: Lost 8-2 in national bronze medal game. 2003/2004: Won 6-5 in OT in national semi-final. 2007/2008: Lost 3-2 in national final. 2008/2009: Won 6-3 at nationals. 2010/2011: Won 6-2 in exhibition at Clare Drake Arena in Alberta. - UNB has never beaten Alberta in a medal game. - UNB has won National Championships in every odd-numbered year since 2007 (2007, 2009, 2011, and 2013). - UNB has never won a National Championship while wearing their dark uniforms. They wore their home white jerseys in all 5 of their National Championship wins. As the lower seed tomorrow they will be wearing their red away jersey or black 3rd jersey. - There have been four previous AUS/Canada West finals. Alberta defeated Moncton in 1999 and UNB in both 2000 and 2008. Saint Mary's beat the Golden Bears in 2010. - The Varsity Reds and Golden Bears have accounted for 8 out of the last 10 National Championships. UNB won in 2007, 2009, 2011, and 2013 while Alberta won in 2005, 2006, 2008, and 2014. At this point everyone knows about Alberta and what they bring to the table. 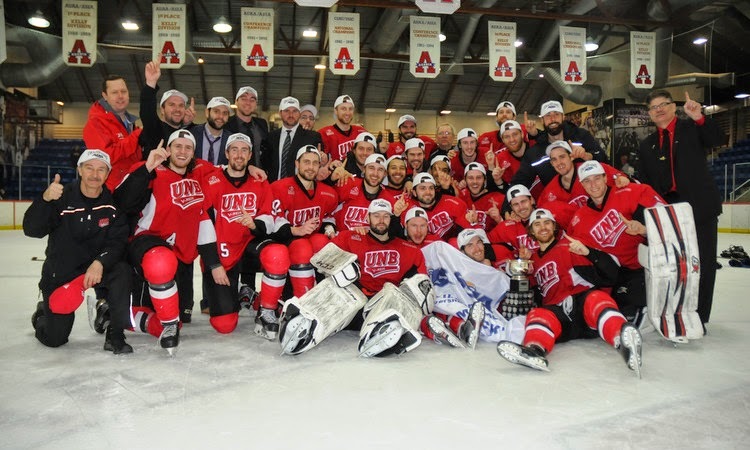 They are the dominant CIS program and considering not only the year they have had thus far, but the fact that they are defending University Cup Champions, they will easily be the toughest team UNB has faced all year. Perhaps the only time this season the V-Reds will be be underdogs. - CIS-best 24-3-1 record in the regular season and 4-0 playoff record. - They led the country with 124 goals scored (UNB was 2nd with 118). - They were 2nd with 56 goals allowed (UNB was 5th with 60). - They led the country with 1155 shots on goal (UNB was 3rd with 1020). - They were 2nd with a 25.7% power play percentage (UNB was 15th at 19.2%). - They were 6th with a 88.1% penalty kill percentage (UNB was 10th at 84.3%). - They led the country with 8 shorthanded goals (UNB was tied for 13th with 4). Unlike Windsor and Guelph, who have good top-6 forwards and top-4 defenceman but weren't able to match UNB's depth up and down the line-up, the Golden Bears won't be at the same disadvantage. Alberta has quality major junior graduates at every spot in their line-up and had 10 different players contribute 10+ points this year. They are led offensively by Canada West MVP and 1st Team All-Canadian T.J. Foster (18 goals, 24 assists) and Canada West 1st Team All-Star Jordan Hickmott (19 goals, 21 assists) while also receiving contributions from forwards Brett Ferguson (27 points), Levko Koper (25), Canada West 2nd Team All-Star Kruise Reddick (22), and Canada West rookie of the year and CIS All-Rookie Team member Stephane Legault (21). CIS Defenceman of the Year and 1st Team All-Canadian Jesse Craige (19 points), Canada West 2nd Team All-Star Jordan Rowley (18), and Thomas Carr (16) are the catalysts from the back-end. In goal, they have rotated goaltenders much of the year with Kurtis Mucha (1.87 GAA, 0.917 GAA) most likely getting the call tomorrow night. Obviously, the V-Reds will be in tough against the Golden Bears. However, there are a few things working in their favour (courtesy UNB supporter and historian Eric Drummie). - The #1 seed has won 5 out of the 8 finals they have been in. The #2 seed, which UNB is, has won 6 out of their 7 appearances. - 59% of the time the eventual winner has come from the host conference. - 59% of the time the winner has played 3 games in 4 days (as UNB did this year). Only 41% of the time has a team won after playing three games in three days (which Alberta is looking to accomplish). - 65% of the time the winner has played in the afternoon pool (like UNB this year). When it comes down to it, this is going to be a very tough game for the V-Reds. The Golden Bears play a similar style to UNB - speed, quick transition from defence to offence, constant puck pressure, and a relentless fore-check with scorers up and down the line-up - but they might even be better at it. Just like any game between two evenly matched teams special teams and goaltending might be the difference. David Shantz needs to be on top of his game as the Golden Bears will undoubtedly generate more than than the 12-15 shots Windsor and Guelph did against the V-Reds. Shantz will need to make all of the easy saves and probably a few that he shouldn't make. On the other hand, UNB should look to get as many pucks as possible on the Alberta goal. Mucha had good numbers this year, but how much of that was a product of the team he plays on? Much like UNB goalies over the years, he probably isn't used to seeing 30+ shots a game. Of course UNB will need to remain disciplined as the Golden Bears power play is extremely dangerous. On paper Alberta has the better special teams so if UNB can at least keep it even that will go a long way to securing a victory. Having said that, while UNB hasn't seen a team like Alberta this year the same could also be said in reverse - the Bears haven't faced a team as good as the V-Reds either. At the end of the day, it is anyone's game. All I know is that it will be a fantastic game that will be close right to the end. Who wins: UNB or Alberta? The University of Alberta Golden Bears once again showed why they are the best team in the country as they over matched the UQTR Patriotes 5-1 in this afternoon's University Cup semi-final in Halifax. This sets up a National Championship match-up between the #1 seeded Bears and #2 seeded Varsity Reds tomorrow night. Just like last night the Bears got stronger as the game progressed as their relentless fore-check and speed was just too much for UQTR to contain for 60 minutes. They scored the lone goal in what was a fairly even played 1st period when Kruise Reddick lit the lamp just 1:14 into the contest. They then added a pair of late goals in the 2nd period, one at 15:39 on the power play and another at 18:58, which basically put the game away. Two more goals, sandwiched around UQTR's lone goal, in the 3rd period, including one into an empty net, rounded out the scoring. - Shots in the game were 42-17 for Alberta. - UQTR was 1 for 4 on the power play. The Bears were 2 for 4. - The Patriotes will face the Guelph Gryphons in tomorrow's bronze medal game at 2PM AST. - As mentioned, Alberta and UNB will face-off for the National Championship tomorrow at 6:30PM AST. The game will be broadcast live on Sportsnet 360. The University of New Brunswick Varsity Reds will be in a familiar position tomorrow night - playing in the National Championship Game. It will be their 10th appearance in school history, including the 7th in the last 12 years. They will be looking for their 6th championship all-time. The V-Reds will be facing either Alberta or UQTR tomorrow night. Interestingly, the Golden Bears (7 games) and Patriotes (4 games) are the two most common University Cup opponents in V-Reds history. However, despite going 4-3 all-time against the Golden Bears at the University Cup, UNB has never beaten them in a title game (0-2). Also, they have never faced UQTR in a Championship game as all 4 previous meetings came in pool play with UNB winning 3 of the games. Philippe Halley led the way with 4 goals and the University of New Brunswick Varsity Reds escaped with a 5-2 victory over the upstart Guelph Gryphons this afternoon at the University Cup in Halifax. UNB now moves on to their 10th National Championship game in school history where they will face either Alberta or UQTR tomorrow at 6:30PM AST. After the Gryphons began the game with a couple of good shifts it was the Varsity Reds who struck just 1:45 into the game when Halley jumped on a loose puck in the crease and shoveled it in after Andrew D'Agostini's save of a Jordan Murray point shot took him out of position. Dana Fraser also got an assists on the goal. The V-Reds then took control of the game, holding a 10-1 shot advantage at one point, but the Gryphons took advantage of a UNB mistake in their own zone and were able to tie the game at 8:01. Colin Suellentrop reached up for a floating puck in front of the net when Seth Swenson leveled him, taking both players out of the play. Former Woodstock Slammer Nick Huard picked up the puck with no one near him and quickly fired it between David Shantz's legs. The game remained tied after one period of play with UNB out-shooting the Gryphons 15-4. UNB went back up by a goal while on the power play 5:59 into the 2nd period when Cam Braes (Murray, Maillet) tipped a shot from the blue line for his 5th goal of the tournament. Once again Guelph had an answer, though, as Nicholas Trecapelli blasted a slap shot from the right circle that beat Shantz stick side for a power play goal at 7:33. The V-Reds responded almost as quickly when Maillet fed a beautiful saucer pass up and over a defenders stick on a 2-on-1 that Halley quickly snapped into the upper part of the net before D'Agostini could get across at 9:16. The period would play out without anymore scoring. Shots in the period were 18-7 for UNB. The 3rd period was played pretty close to the vest with neither team generating much in way of offensive chances for the first 12 minutes or so. UNB had a golden opportunity to extend their lead with 6 minutes left when Cameron Brace, the trailer on a 3-on-1 rush, picked up a rebound and was all alone in front, but his shot was stopped by D'Agostini. Shortly afterwards Tyler Carroll was sent off for high-sticking, giving the Gryphons a chance to tie it up. The V-Reds came up with the clutch penalty kill and were able to control much of the play as time winded down, not allowing Guelph to pull their goalie. UNB was able to put the game away with just 1:05 remaining when Randy Gazzola made an excellent play at the boards near centre ice to keep the puck from being sent down the ice. After knocking down the puck with his body he broke into the Gryphons zone on a 3-on-1 with Cam Critchlow and Halley and out-waited the defender before finding Halley at the other side of the net for the easy tap-in goal. Halley added one more for good measure when he found the empty net from just inside the red line at 19:23. Shots in the period were 7-4 for UNB. - R.D. Chisholm, Peter Trainor, and Francis Beauvillier all remained out of the line-up. - UNB outshot the Gryphons 40-15 in the game. - The Varsity Reds won 35 out of 61 face-offs with Dana Fraser (20 out of 27) doing the bulk of the work. - Both teams were 1 for 2 on the power play in a game that was much more disciplined and less physical than what we have seen this weekend. - Halley and D'Agostini were named the player's of the game. - For the 2nd straight game the V-Reds found themselves in a close game into the 3rd period despite holding a significant edge in play, but for the 2nd straight game they were able to finally pull away at the end to make the game look more comfortable than it actually was. - Chris Caissy took a knee to the face as he was falling to the ice and left the game for a brief period before eventually returning to the bench. Sportsnet reported that he broke his nose on the play. - Colin Suellentrop was the only player for UNB not to register a shot on net. - Halley tied Cam Braes and 6 others for the most goals scored in a University Cup game. - Braes goal was his 5th all-time at the University Cup, tying Kyle Bailey and Lachlan MacIntosh for the 2nd most in school history. Only Daine Todd (6) has more. - The CIS game recap can be found here. - The Gryphons will face the loser of this afternoon's Alberta/UQTR semi-final for the bronze medal tomorrow at 2PM. - Of course the Varsity Reds await the winner of that game to see who they will face on the gold medal game tomorrow night. Game time is scheduled for 6:30PM AST and can be seen on Sportsnet 360. The University of New Brunswick Varsity Reds will be be looking for their 9th National Championship game appearance when they face the upstart Guelph Gryphons in the University Cup semi-finals tomorrow afternoon in Halifax. The game is scheduled for 12PM and will be shown live on Sportsnet 360. This will be only the 3rd time these two schools have met with each team having won once. The Gryphons defeated the V-Reds 4-3 in the 1997 University Cup final in Toronto in what was UNB's first ever title game appearance. The V-Reds then topped Guelph 4-2 at the 2010 Fall Classic at the AUC. The Gryphons are currently in the midst of one of the greatest Cinderella runs we have seen in recent memory. They went 3-10-3 in the first half of the regular season, which included a 0-7-1 mark in their last 8 games before the Christmas break. However, they had some bad luck in the process, going 0-8-0 in one goal games. As we all know, luck in sports tends to even out over time and Guelph, not surprisingly, turned it around in the 2nd half as they won 8 out of their 11 games which included a 3-1-0 record in one goal games. They ended the season 11-13-3 overall and finished 6th place in the OUA West division. The Gryphons kept up their 2nd half performance into the playoffs as they knocked off Waterloo in 3 games (after losing the first game), knocked out Toronto in 3 games after once again losing the first game, swept regular season champion Windsor in two games, and then won the OUA Championship with a 4-0 victory over the UQTR Patriotes in the Queen's Cup. This run propelled the Gryphons to their first University Cup appearance since capturing their only National Championship in school history in 1997 when they beat UNB in the finals. The Gryphons have been led by the outstanding goaltending of conference All-Rookie team member Andrew D'Agostini. Despite unspectacular numbers in the regular season (20 games, 3.25 GAA, 0.901 save percentage) he has been absolutely lights out in the playoff. He shut out the high powered Patriotes in the OUA final and then continued his strong play by stopping 42 out of 43 shots in the Gryphons University Cup opener against Calgary on Thursday. Offensively the Gryphons rely on former Woodstock Slammer forward Nick Huard who had 28 points (11 goals, 17 assists) and was rewarded for his efforts by being named a 2nd Team OUA West All-Star. The V-Reds will also need to keep an eye on forwards Carlos Ametsoy (10 goals, 16 assists), Robert De Fulviis (14 goals, 12 assists), and Teal Burns (7 goals, 16 assists). MacKenzie Nichol led their defencemen in scoring with 18 points, including 6 goals. At the end of the day I think it is safe to say that, much like their first game against Windsor, it would have to be considered a tremendous upset if the V-Reds were to lose to the Gryphons. One has to think Guelph, and Dagostini more specifically, is due for a bad game after such an incredible stretch. They aren't as bad as they showed in the 1st half, but they probably aren't quite as good as they have shown during this 8-2 playoff/University Cup stretch either. They were in the bottom half of the nation in goals against and I think UNB's depth and constant forecheck and pressure will be too much for the Gryphons defense to handle for 60 minutes. The V-Reds are usually good at exploiting weaker defensive teams so unless Dagostini plays out of his mind one would have to think the V-Reds will be able to put some goals on the board. Guelph's special teams haven't been anything outstanding this year either which bodes well for UNB's rejuvenated power play and their penalty kill, which has been great since the AUS playoffs started. Unfortunately for the Gryphons, I think their magical run ends tomorrow afternoon and the V-Reds will be moving on to another National Championship game on Sunday evening. The defending University Cup champion University of Alberta Golden Bears showed why they have been the top ranked team in Canada all season by dominating the host St. FX X-Men 5-1 tonight in Halifax. The Golden Bears will move on to play the UQTR Patriotes tomorrow afternoon in the national semi-final while the X-Men see their season come to an end. St. FX got off to a great start as they took a 1-0 lead 7:54 into the game after Blake Gal converted on a 2-on-1 rush with Michael Kirkpatrick. Jordan Hickmott answered for the Bears with two minutes remaining in the period while shorthanded and it completely changed the momentum of the game. The Golden Bears would never look back after tying the game, dominating in all facets for the last 42 minutes. Alberta received goals from Brennan Yadlowski and Travis Toomey in the 2nd period and Kruise Reddick and T.J. Foster in the 3rd period as they held a huge advantage territorially as well as on the clock shot. After only out-shooting the X-Men 9-7 in the 1st period the Golden Bears held a 15-1 advantage in the 2nd and 10-5 in the 3rd for a game total of 34-13. - Foster and X-Men Rob Slaney were named the player's of the game. - St. FX went 0 for 4 on the power play. Alberta was 0 for 1. - The X-Men did dominate in the face-off circle, winning 43 out of 65 draws. - So after the quarter-finals the last four teams standing end up being the top four seeds, setting the stage for tomorrow's semi-finals. UNB and Guelph will play at 12PM and UQTR and Alberta will play at 4PM. Both games can be seen live on Sportsnet One. The winners will move onto Sunday night's National Championship game while the losers will play Sunday afternoon for bronze. The #5 seeded and AUS runner-up Acadia Axemen looked well on their way to a quarter-final victory over the #4 seeded and OUA runner-up UQTR Patriotes this afternoon at the University Cup, but the Patriotes rallied from a 5-2 3rd period to shock the Axemen 6-5 in overtime. The Patriotes will now face the winner of tonight's Alberta/ST. FX game in tomorrow's 2nd semi-final while the Axemen's season comes to a disappointing end. Through the first two periods it was all Acadia as they jumped out to a 4-1 lead on goals by Chris Owens (10:00 of the 1st), Remy Giftopoulos (1:22 of the 2nd), Boston Leier (2:05 of the 2nd), and Taylor Makin (16:27 of the 2nd). They also held a 26-16 advantage in shots through the first 40 minutes. Martin Lefebrve (12:17) had the lone marker for UQTR, which briefly cut the lead to 3-1. The 3rd period was a completely different story. Guillaume Asselin made it a 4-2 game just 58 seconds in, but when Mike Cazzola pushed the lead back to 3 at 6:41 it appeared the Axemen were once again back in control. However, the Patriotes have long been known as an offensively gifted team and they showed it today by scoring 3 goals in a span of 2:39 around the mid-point of the period to tie the game at 5. Felix Plouffe (9:44), Billy Lacasse (12:04), and Asselin (12:23) all found the net behind Axemen goalie Brandon Glover. The game would remain tied until the end of regulation with both teams firing 12 shots on goal in the frame. The Axemen received a golden opportunity to end the game in OT when they received an early power play. They couldn't do anything with it and the Patriotes made them pay when Vincent Marcoux kept the puck on a 2-on-1 rush and teed up a slap shot that beat Glover for the game winner at 8:40. Shots in the overtime were 4-3 for UQTR. - Shots in the game were 41-32 for Acadia. - Acadia was 2 for 5 with the man advantage. UQTR was 0 for 2. - Owens and Marcoux were named the player of the game for their respective teams. - The quarter-finals conclude this evening when the #1 seeded Alberta Golden Bears take on the #8 seeded and host St. FX X-Men. Game time is 7PM and can be viewed online at www.CIS-SIC.tv. - The Guelph Gryphons and UNB Varsity Reds will play in the first semi-final tomorrow at 12PM while the Patriotes and X-Men/Golden Bears winner will play in the other semi-final at 4PM. Both games will be broadcast on Sportsnet 360. The V-Reds started the game strong with sustained pressure and a couple of quick shots on Lancers goalie Parker Van Buskirk, but a lackluster early power play seemed to sap some of their momentum. The game evened out and both teams traded chances back and forth, although each team only managed three shots on goal at the midpoint of the period. Late in the period, after UNB had just killed off a Matt Boudens penalty, Tyler Carroll was sent off for hooking at 15:20. The V-Reds penalty kill, which was outstanding all night against one of the top power plays in the country, not only killed off the penalty, but was able to score a shorthanded goal. Rob Mignardi collected the puck behind the Lancers goal and found Cameron Critchlow all alone in front. Critchlow's initial shot was stopped, but he stuck with the puck and was able to push in a loose puck at 17:15. UNB took a 1-0 lead into the intermission and held a 9-4 shot advantage. The Varsity Reds special teams stepped up again early in the 2nd period, but this time it was the power play coming through. Just after Dana Fraser's shot hit the post he got the puck back just to the left of Van Buskirk, made a few nifty stickhandling moves, and found Cam Braes in tight for the quick snap shot at 1:20. Just when it looked like the V-Reds were starting to take over the game - they had a couple of quality chances after the Braes goal - the Lancers took advantage of a turnover just outside the UNB blue line. The Lancers broke in on a 2-on-1 and it was Drew Palmer picking up the rebound for an easy tap-in goal at 6:13 to cut the lead in half. Both teams would get two power play chances before the end of the period, but the score remained 2-1 after two. UNB out-shot Windsor 10-5 in the frame. The 3rd period was all UNB as the Lancers started to become unraveled. The V-Reds were forced to kill off an early power play and then were able to extend their lead at 7:29 after Van Buskirk bobbled a Tyler Carroll shot. Cam Braes was driving to the net and was able to punch the loose puck into the net for a 3-1 lead. Shortly after the goal the Lancers would go back to the power play - their 7th of the night - and they were finally able to break through. CIS Player of the Year Spencer Pommells took the puck near the left boards and fired a laser beam over David Shantz's right shoulder and into the top corner at 8:40 to cut the lead back to one. However, their momentum was short lived as Lancer Blake Blondeal took exception to something Braes did after a whistle and proceeded to cross-check him in the face, earning a 5-minute major and a game misconduct in the process. The Lancers problems were further exacerbated just under three minutes into the major when Mike Christou ran Braes, who was a target all night, and took an interference penalty. Braes then made them pay, in a big way. At 13:37, while on the 5-on-3, Braes picked up Jordan Murray rebound and quickly fired it into the net for his 3rd goal of the night. Then, just one minute later and still operating on the 5 minute power play, he struck again. Philippe Maillet's rushed down the left side and had his shot deflected by Van Buskirk's shoulder. However, the puck bounced high off the back boards and into the Lancers goalie's feet and Braes was able to poke the puck in before it could be covered up. Chris Caissy rounded out the scoring with an empty net goal with just 10 seconds remaining. Shots favoured UNB 19-3 in the period and 38-12 in the game. - Peter Trainor, Francis Beauvillier, and R.D. Chisholm were all scratched. - UNB was 3 for 8 on the power play. Windsor was 1 for 7. - UNB won 45 out of 72 face-offs with Dana Fraser (17 out of 23) having a big night. - Braes and Palmer were named the players of the game for their respective teams. - Braes also had 2 goals and 2 assists in the V-Reds 6-5 win over the Lancers on January 3rd. - Not surprisingly, Braes' set a team record with 4 goals in a University Cup game. It also tied a tournament record, done 6 previous times. - UNB's 6 goals are tied for their 2nd most ever at a University Cup game, only behind the 8 they scored against UQTR in 2013. This is the 7th time they have accomplished the feat. - UNB is now 11-1 in their last 12 games at the University Cup and 16-2 in their last 18. - The V-Reds will now enjoy a day off before facing the Guelph Gryphons on Saturday afternoon in the national semi-final. Game time is scheduled for 12PM and can be seen on television on Sportsnet 360. The game will also be streamed online at www.CIS-SIC.tv, but on a pay-per-view basis. - The other two quarter-finals are on tap for tomorrow. First up, at 1PM, the #4 seeded and OUA runner-up UQTR Patriotes take on the #5 seeded and AUS runner-up Acadia Axemen. At 7PM the #1 seeded and Canada West champion Alberta Golden Bears face-off against the host St. FX X-Men in front of what will undoubtedly be a large and boisterous crowd. Both games can be seen on www.CIS-SIC.tv. The two winners will move on to face on another in Saturday's 2nd semi-final, scheduled for 4PM. The Guelph Gryphons magical run has continued as the OUA Champion defeated the Calgary Dinos 3-1 in the first game of the 2015 University Cup. They now move on to face the winner of tonight's UNB/Windsor game in Saturday's first semi-final while the Dinos season has come to an end. Despite being seeded 3rd for the tournament the Gryphons had their work cut out for them heading into the the match-up against the 6th seeded Dinos, a team that won 20 regular season games compared to only 11 for Guelph. The Gryphons got on the board first with a power play marker by Teal Burns with just 39 seconds remaining in the first period. That goal would hold up until the first minute of the 3rd period when Chris Collins tied the game for Calgary. Guelph responded just under four minutes later when a slap shot from the blue line from Carlos Amestoy went off the post and into the top corner. They would then add some insurance when Seth Swenson emerged out of a scrum in the corner with the puck and tucked a shot between the legs of the Dinos Kris Lazaruk with 3:03 left in the game. That would prove to be all the scoring as Guelph held on for the 3-1 decision. - Calgary out-shot the Gryphons 43-26 in the game. Andrew Dagostini continued his recent strong play between the pipes for Guelph. - Guelph was 1 for 4 on the power play. Calgary was scoreless in their 4 opportunities. - Up next at the University Cup is the game between the #2 seeded UNB Varsity Reds and the #7 seeded Windsor Lancers. Game time is 7PM and you can watch the web-cast here. University of New Brunswick Varsity Reds head coach Gardiner MacDougall was named the recipient of the Father George Kehoe Memorial Award as the coach of the year at the CIS Awards Gala held tonight in Halifax. MacDougall, who also won the award in 2009-2010, led a young Varsity Reds squad to an 8th straight AUS regular season pennant as well as their 4th AUS Championship in the last 5 years. - Windsor Lancers forward Spencer Pommells as player of the year. - Defenceman Spencer Abraham of Queen's as rookie of the year. - Saint Mary's Huskie Anthony Peters as goalie of the year. - Alberta Golden Bear Jesse Craige as defenseman of the year. - Elgin Pearce of the Calgary Dinos as the most sportsmanlike. - Oliver Hinse of the Concordia Stingers as the Dr. Randy Gregg Award winner, which is given to the player that best combines hockey excellence, academics, and community service. The 1st and 2nd team All-Candian Teams were also announced, along with the All-Rookie Team. Varsity Reds defenceman Jordan Murray and forward Philippe Maillet were named to the 1st team, while defenceman Randy Gazzola was named to the All-Rookie team. The 2015 University Cup gets underway tomorrow afternoon when the OUA Champion Guelph Gryphons face the Canada West runner-up Calgary Dinos at 1PM. The Varsity Reds hit the ice at 7PM for their quarter-final game against the Windsor Lancers. Both games can be viewed online here. Many will look at the results of the two game series played between the Lancers and V-Reds over this past Christmas break and assume that UNB will roll to an easy win. However, it should be noted that the Lancers were missing a couple of their top players for those games and Thursday night's game should prove to be a much closer tilt. The Lancers actually posted a better regular season record than UNB this year at 22-4-1, spending all 20 weeks ranked in the Top 10 with a high of #3. They boast the 3rd most potent offense (4.22 goals/game, just ahead of UNB) and the 5th best power play (23.6%) in the nation so the V-Reds will have to be on their game defensively. We seen a glimpse of how explosive the Lancers can be offensively in the first game between the two teams this year. While they were not as strong at keeping pucks out of the net as UNB was (11th in the country allowing 2.68 goals/game compared to 4th, 2.12 for the V-Reds), Lancers goaltender Parker Van Buskirk has proven that he is capable of stealing a game for his team. The OUA West goalie of the year and 1st Team All Star posted a 2.86 GAA and .905 save percentage this season. Some other players for the V-Reds to keep an eye on include CIS leading scorer, OUA West MVP, and OUA 1st Team All Star Spencer Pommels (16 goals, 34 assists), OUA West defenceman of the year Kenny Bradford (8 goals, 20 assists), and OUA West rookie of the year Dylan Denomme (13 goals, 18 assists). However, while the Lancers are not to be taken lightly, the V-Reds should be confident given their previous meetings and recent play against Acadia in the AUS Finals. UNB has beaten the Lancers four times in the last 18 months and played arguably their best hockey of the season in their two game sweep of the Axemen. They have also tended to do very, very well against OUA opponents, especially those who are more offensively oriented and are willing to get into a fast-paced, back-and-forth style of game (see the last couple games against UQTR). This game could take on a similar tone, although the Lancers may draw off the experience of already having played UNB his season and adjust accordingly. Ultimately, Windsor has had a fantastic season but it is unlikely they have faced the same calibre of opponents that UNB has, not to mention they probably haven't faced a team as good or as deep as UNB in the OUA all season. We all know anything can happen in a one game showdown - a bad bounce, a hot goaltender, a flukey goal - but expect the game to remain close before the V-Reds eventually wear down and pull away. It would have to be considered a fairly big upset if the Lancers were to emerge victorious. Who wins - UNB or Windsor? 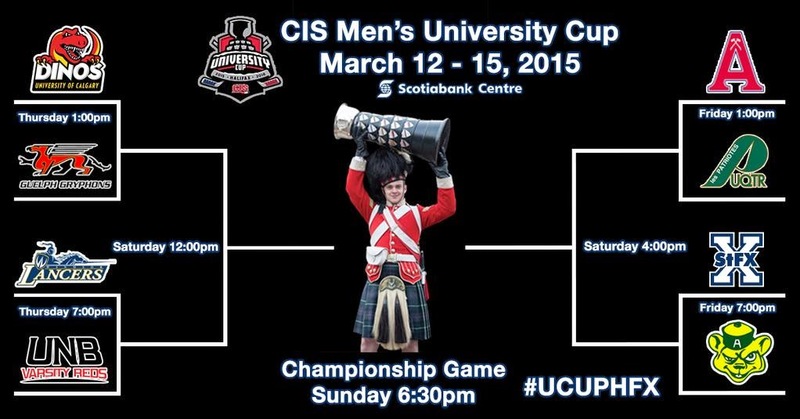 - The CIS has published their always informative - and lengthy - University Cup preview. It is definitely worth checking out. - The CIS is running a Championship Bracket Challenge in which you can make your picks in any of the four CIS Championships being contested this weekend - men's and women's hockey and men's and women's basketball. There will be one winner selected at random per sport and they will receive a CIS prize pack. You can make your picks here. - The UNB Associated Alumni has a nice summary of everything UNB fans need to know for this weekend. - The V-Reds left for Halifax earlier today and just arrived a few hours ago, according to the UNB Hockey Twitter account. - Varsity Reds forward Philippe Maillet was once again named the UNB male Athlete of the Week. Maillet was named the AUS MVP and a First Team All-Star after leading the conference in scoring. He followed that up by posting 7 points in 7 playoff games and being named the Playoff MVP after leading the V-Reds to the AUS Championship. When the Varsity Reds hit the ice against the the OUA's Windsor Lancers on Thursday night they will be making their 12th appearance at the University Cup since 1996-1997, including 9 under current head coach Gardiner MacDougall. Here is how they fared in their previous 11 tournaments. - UNB has won their opening game at all 11 previous tournaments. - MacDougall has only lost one game by more than 1 goal at Nationals (8-2 loss to Alberta in 2003 Bronze Medal Game). - MacDougall is 10-2 against OUA teams all-time at the University Cup (4-3 loss to UQTR in 2003 round robin, 3-2 loss to Western in 2012 round robin). - UNB is 42-2-1 against OUA teams under MacDougall. They are 32-0-1 in exhibition games to go along with the aforementioned 10-2 record in University Cup games. - UNB's only previous University Cup game against Windsor was a 3-2 overtime victory in their opening game of the 1998 tournament. Ryan Burgoyne scored the game winner as UNB would eventually go on to win their first National Championship in school history. The CIS has announced the draw and schedule for the University Cup, and just as we predicted the #2 seeded University of New Brunswick Varsity Reds will open the tournament against the OUA bronze medal-winning #7 seeded Windsor Lancers on Thursday night at 7PM. The winner of that game will face either #6 seeded Calgary or #3 seeded Guelph in the semi-finals on Saturday afternoon. The four quarter-final games and Bronze Medal Game will be web-cast on www.CIS-SIC.tv while the two semi-final games as well as the Gold Medal Game will be aired live on Sportsnet 360. The Lancers and V-Reds should be fairly familiar with one another as the two teams played a pair of games over the Christmas break at the AUC. UNB took both meetings, winning by scores of 6-5 and 7-1. However, it should be noted that the Lancers played those games missing a couple of their key players, so expect Thursday night's game to be more evenly matched. Windsor also visited the AUC in the fall of 2013 and the V-Reds emerged as 5-0 and 5-4 victors in those two games. We will have more stats and info in the coming days. The CIS playoffs concluded around the country this weekend and not only do we now know all 8 participating teams at this week's University Cup, but we also have a very good idea how the bracket will look. The #1 ranked Alberta Golden Bears claimed another Canada West Championship by virtue of a two game sweep over the Calgary Dinos. The Bears defeated the Dinos 5-2 on Thursday night and 2-1 on Friday night. Meanwhile, the OUA picture came into focus yesterday. The Guelph Gryphons, a sub 0.500 team this year, continued their storybook playoff run with a 4-0 shutout of the UQTR Patriotes to capture the Queen's Cup and OUA Championship. In the bronze medal game the Windsor Lancers tied the game with just 1:01 remaining before knocking off the McGill Redmen 2-1 in overtime, becoming the 8th and final entrant at the University Cup. Based on this we can try and predict how the bracket will shape up. 1. The three (3) Sport Conference champions will be seeded 1st, 2nd, and 3rd based on their respective team national ranking in the final Top Ten of the season. The last Top 10 ranking will be done after the Sport Conference playoffs are completed. This means that Alberta (CW Champions), UNB (AUS Champions), and Guelph (OUA Champions) must be seeded 1st, 2nd, and 3rd. There will be one more Top 10 poll, but given the fact Alberta has been ranked #1 all year and proceeded to win their conference playoffs it is extremely unlikely they fall out of the top spot. Moreover, UNB was ranked #2 most of the year while Guelph spent all but this past week outside of the Top 10. Based on this it is reasonable to assume Alberta will be seeded #1, UNB #2, and Guelph #3. 2. The OUA finalist (either the OUA East or OUA West divisional champion) will be seeded #4. The UQTR Patriotes were the OUA East divisional champions and OUA runner-up. Thus, they are #4. 3. The remaining 4 qualifying teams will be seeded using the final Top Ten of the season as a guiding tool. Again, there should be one more Top 10 poll released, but if we look at last week's rankings Acadia was ranked #3, Calgary #4, St. FX #8, and Windsor #10. Essentially, number 4 just states that 3rd place teams from the OUA (Windsor) and AUS (St. FX) can't be ranked higher than the 2nd place teams from the AUS (Acadia) or Canada West (Calgary), which isn't the case anyway so we don't have to worry about it. Once the seeding has been completed, teams 5 through 8 can be flipped no more than two spots (up or down) to try to avoid first round match-ups of teams from the same sport conference. (This means teams seeded 1 through 4 cannot be flipped). This would also have the added benefit of keeping the two Canada West teams on opposite sides of the draw, something the committee has always tried to do in previous years when there are two teams from the same conference in the tournament. Of course, we could reach the same conclusion if Windsor is ranked higher than St. FX in the final Top 10 poll, which is likely given the fact Windsor has played, and beaten, McGill in the last week while St. FX sat idle. According to all of the above it is quite likely that #1 Alberta/#8 St. FX and #4 UQTR/#5 Acadia will be the quarter-final match-ups on one side of the draw and #2 UNB/#7 Windsor and #3 Guelph/#6 Calgary will be the quarter-final match-ups on the opposite side. It is also important to note that teams will NOT be re-seeded after the quarter-finals, so the winner of the #1/#8 match-up will play the #4/#5 winner and the #2/#7 winner will play the #3/#6 winner regardless of what teams move on. It doesn't sound like we will have to wait long, however, to hear the official announcement from the CIS. According to the UNB Hockey Twitter account, the seedings and schedule will be announced at 7PM this evening. The AUS announced the men's hockey award winners as well the 1st, 2nd, and All-Rookie teams yesterday and it was a big day for the V-Reds. - Forward Philippe Maillet captured the MVP award (Kelly Trophy) after leading the league in scoring with 39 points and posting a +17 rating. He is the 4th V-Red in history to take home the award, joining Dax McLean (1997-98), Rob Hennigar (2007-08), and Hunter Tremblay (2009-10), and will now represent the AUS as its nominee for the CIS Player of the Year. - Defenceman Randy Gazzola became the 10th UNB player, and 2nd consecutive after Maillet last year, to win the AUS Rookie of the Year (A.J. MacAdam Award). Gazzola was an impact player in his freshman year, putting up 24 points and the 2nd best +/- rating in the conference at +21 all while logging big minutes and being a key contributor on both special teams units. Gazzola will now look to become the 3rd UNB player to be named the CIS Rookie of the Year after Kevin Young (2003-04) and Ryan Lindsay (1997-98) accomplished the feat. - Head coach Gardiner MacDougall was named the AUS Coach of the Year (Bob Boucher Trophy) for the 4th time in his career after leading a young Varsity Reds team to a 22-4-2 record and an 8th straight 1st place finish. MacDougall will be the conference nominee for the CIS Coach of the Year Award, which he won in 2009-10. - Other awards handed out included the Most Sportsmanlike Player, given to Saint Mary's rookie forward Ben Duffy, and the Student-Athlete Community Service Award, given to St. FX X-Men forward Robert Slaney. - Maillet and defenceman Jordan Murray were both named 1st team all-stars while Gazzola was named to the 2nd team. Gazzola and forward Cameron Brace were both recognized by being named to the all-rookie team. - You can read the full press release here. After a disappointing end to their 2013-2014 season the University of New Brunswick Varsity Reds climbed back to the top of the AUS mountain after defeating the Acadia Axemen 4-2 tonight in Wolfville to win the AUS Championship in a two game sweep. UNB's 14th conference championship in school history - and 4th in 5 years - moves them into sole possession of 2nd place place all-time, behind only St. FX (24 titles). - The Axemen got on the board just 3:24 into the game, taking their first lead of the series when Taylor Makin took advantage of a Jordan Murray turnover in his own end and beat David Shantz. UNB was able to respond at 10:22 after a goal mouth scramble ended with Rob Mignardi (Critchlow) finding the loose puck and getting it past Axemen goalie Brandon Glover. The Axemen regained the lead at 18:03 when Remy Giftopoulos backhanded in his 2nd power play goal of the series. Acadia took a 2-1 lead into the intermission. Shots in the period were 15-12 for UNB. - The V-Reds scored the only goal of the 2nd period to tie the game at 2. After not scoring a goal in the regular season it was Chris Caissy (MacDougall, Murray) converting a big rebound for his 2nd of the playoffs to get UNB even heading into the 3rd period. Shots favoured Acadia 12-10 in the period. - The Varsity Reds saved their best period for last, out-shooting the Axemen 17-6 in the frame. However, although UNB had slowly started to take over the game after the 1st period, the Axemen had a glorious opportunity to take the lead when they received a brief 16 second 5-on-3 power play with just under 8 minutes remaining. The V-Reds penalty killing, which was great in the postseason, came through with a big kill and they were finally rewarded for their efforts with just 1:48 remaining. Dana Fraser cleanly won a face-off back to Jordan Murray and Murray's wrist shot from the blue line was deflected past Glover by Philippe Halley, proving to be the championship winning goal. Dylan Willick closed it out with an empty net goal with just 14 seconds remaining. - Shots in the game were 42-30 for UNB. - UNB went with the same line-up as game 1 as defenceman Adrian Robertson and forwards Peter Trainor and Francis Beauvillier all remained out. - Acadia was 1 for 5 on the power play. UNB was 0 for 4. - Philippe Maillet, Halley, and Glover were named the game's three stars. - UNB only won 25 out of 60 face-offs in the game. Dana Fraser (12 out of 23) was the only one of the three main centres (MacDougall, Willick) who was above 40% on the night. - Every player on UNB had at least one shot on goal tonight and no one had a negative +/-. - This is UNB's first victory in Wolfville in three tries this season. - Recently minted AUS MVP Philippe Maillet added to his hardware collection by being named playoff MVP. Maillet scored 5 goals, to go along with 3 assists, in UNB's 7 postseason games. - Jordan Murray led all AUS players with 9 playoff points. Maillet was tied for 2nd with his 8 points, Tyler Carroll and Cam Braes tied for 4th with 7 points, and Cam Brace was 7th with 6 points. - David Shantz put up a 5-2 record, 2.31 GAA, and 0.893 in playing all 416 minutes during the Championship run. - UNB has now won 3 straight playoff series over the Axemen, winning 8 out of the 9 games played. - With the win the Varsity Reds have almost certainly guaranteed themselves at least a top-2 seed at next weeks University Cup in Halifax. It is likely the only way UNB can get the top overall seed is if #1 ranked Alberta loses to Calgary in the Canada West final this weekend. - It is also quite likely they will be facing the OUA's 3rd place team (either Windsor or McGill) in the quarter-finals. - The official announcement regarding the seeding and schedule for the tournament is expected to be made public Monday. We will have more information as it becomes available. A few stories to pass along as the V-Reds and Axemen prepare for game 2 of the AUS Finals tomorrow night. - The CIS released their latest men's hockey rankings today and for the 19th time in as many polls the defending champion Alberta Golden Bears claimed the top spot. Meanwhile, the Varsity Reds picked up all 16 2nd place votes to remain in 2nd spot for the 5th consecutive week, and 13th week overall this season. Other AUS teams to make the rankings this week include Acadia (3rd, up two spots), St. FX (8, up two spots), and Saint Mary's (9th, down 6 spots). - With CIS playoff action winding down across the country we now know 7 out of the 8 participants for next week's University Cup in Halifax. In the AUS, conference finalists UNB and Acadia will be joining host St. FX at the tournament. Out west the Alberta Golden Bears and Calgary Dinos have both advanced by virtue of their semi-final victories last weekend. They will play one another Thursday, Friday, and Saturday (if necessary) to determine the Canada West champion. The OUA playoffs produced a pair of upsets. The 19-4-3 UQTR Patriotes defeated the East division regular season champion McGill Redmen (21-5-0) in the East final and the 11-13-3 Guelph Gryphons shocked the West division regular season champion Windsor Lancers (22-4-1) in the West final. The Patriotes and Gryphons have both advanced to the University Cup and will play Saturday in the Queen's Cup to decide the OUA Champion. The Redmen and Lancers will also play on Saturday to determine the 3rd OUA berth. - Former V-Reds captain Chris Culligan, now playing for the Cardiff Devils in the British Elite Ice Hockey League, has received some publicity in the hockey world after scoring a highlight-reel goal last week. Check it out below (video courtesy www.cardiffdevils.com). The University of New Brunswick Varsity Reds got off to a strong start in their quest for an AUS Championship, blitzing the visiting Acadia Axemen 8-2 tonight at the AUC in a game that even the most optimistic UNB fan probably would not have predicted. Conference scoring champion Philippe Maillet led the way with four power play goals as the Varsity Reds took a 1 game to 0 lead in the best-of-3 series AUS Finals. The V-Reds got off to a quick start, scoring on their first two shots, and three of their first five. Maillet (Brace, Fraser) set the tone with a power play marker just 1:25 into the game and Cameron Brace (Braes, Carroll) doubled the lead just 1:55 later. Maillet (Brace, Murray) sent Axemen goalie Brandon Glover to the bench early with his 2nd power play goal of the game at 8:15. Acadia cut into the lead when Travis Randell beat David Shantz on a short breakaway at 15:30, but Jordan Murray (Fraser, Wall) restored the 3 goal cushion with just 25 seconds remaining in the period. Acadia argued the goal as it appeared that the puck went off Murray's skate as he drove the net, but it was ruled that there was no distinct kicking motion and the goal stood. Shots in the period were 11-8 for UNB. The V-Reds started the 2nd period exactly how they started and ended the first, with a goal. This time it was Tyler Carroll (Murray, Braes), who's knuckle shot from the slot threw off the timing of Axemen back-up goalie Robert Steeves and found the back of the net. Acadia made it 5-2 just 15 seconds into a power play at 11:24 courtesy of a Remy Giftopoulus shot that went through a maze of bodies in front and into the top corner. However, some undisciplined play by the Axemen allowed the V-Reds to score another late goal. UNB was on the power play when the Acadia bench was assessed another penalty for unsportsmanlike conduct, giving the V-Reds a short 5-on-3 power play. Maillet (Murray, Brace) made them pay when he completed his power play hat trick with only 14 seconds remaining in the period, and just as the first power play expired. UNB would take a 6-2 lead into the intermission after out-shooting Acadia 14-7 in the frame. A series of penalties marred the 3rd period as both teams seemed content to play out the string. UNB closed out the scoring with Maillet's (Braes, Fraser) 4th power play goal of the night at 8:01 and Colin Suellentop's (MacDougall) first career AUS playoff goal at 18:58. Shots favoured UNB 13-6 in the period and 38-21 in the game. - Adrian Robertson was out of the line-up tonight after taking a hard hit in game 5 against St. FX that caused him to leave the game early. Matt Petgrave drew back in to replace him. Peter Trainor and Francis Beauvillier were also scratched. - Acadia was missing two of their best players in high scoring defenceman Chris Owens and rookie of the year front runner Zachary Franko. It appears that neither player will play this series. - Shantz was solid in goal, stopping 19 out of 21 shots, including a pair of big saves just after the Axemen had cut the lead to 3-1. - Acadia was clearly perturbed by the refereeing tonight and it definitely took them off their game a bit as they took a few undisciplined penalties and were not short on words for the officials throughout. As a result they were called for 44 minutes in penalties compared to 18 for UNB. - The V-Reds went 4 for 9 on the power play while the Axemen were 1 for 5. - UNB won 37 out of 66 face-offs with Dana Fraser (14 out of 24) leading the way. Defenceman Randy Gazzola was forced to take a face-off and managed to win it to finish 100% on the night. - Maillet (4 goals), Brace (1 goal, 3 assists), and Murray (1 goal, 3 assists) were named the game`s three stars. - This is the 6th straight time UNB has won game 1 of the AUS Finals. They have gone on to win the Championship in 5 of those instances. Their only loss was in 2009 against Saint Mary's when they won game 1 by a 5-1 score before losing the next two games. The last time they lost game 1 of an AUS Finals series was in 2007 when they were swept in two straight versus Moncton. - UNB's 8 goals tonight is tied for the most they have scored in an AUS Finals game. They defeated Moncton 8-3 in game 1 in 2012. - The Varsity Reds will attempt to close out the series on Wednesday night when they travel to Wolfville, where they have yet to win this year. Game time is 7PM and can be seen online at www.AUStv.ca.